Considered as one of the most talented early Richmond artists, Charles Conner was not only an artist but also a musician. He played the coronet in the Conner Orchestra with his four older brothers, often playing solos. Self-taught, he began his career as an industrial painter for Hoosier Drill which later became International Harvester Company. Conner became a close friend with John Bundy and began exhibiting his works along side the Richmond group artists. 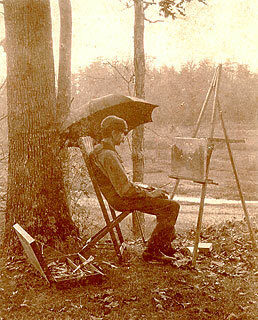 A true plein-air enthusiast, he would do much of his sketching and painting outdoors and would sleep in a tent for months recording the Fountain City landscape. 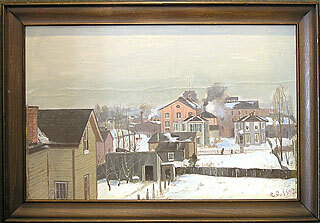 In 1887, he moved to California with his brother Albert, also a painter. He spent the next eight years painting the Pacific Coast before he would return to Richmond. It was during this time that his painting improved immensely. In 1904, Conner made a place for himself in the art world by having his masterpiece, “Wet Night in February” exhibited in the main hall of the St. Louis World’s Fair along side works by nationally recognized artists. This same work was the sensation in the great exhibition of Indiana art shown in Tomlinson Hall, Indianapolis in 1903. It was here that the work was selected for the World’s Fair. But it was an art jury that then selected it to hang in the prestigious Central Pavilion for thousands of visitors to see at the World’s Fair. Yet despite his talent and recognition, the most Conner ever received in his lifetime for a work was $150. This work, “The Old Swimming Hole” was purchased in part by Indianapolis philanthropist, Emil Deitz and the school children of his hometown, Fountain City who collected $50 worth of pennies to purchase the work. The painting is still owned by the Northeastern Wayne School Corporation. Tragically, he would die an early death in 1905. John Bundy considered him the best painter within the Richmond Group and one can only speculate what he might have accomplished artistically if he his life had not ended so early. Palladium-Item and Sun Telegram, September 28, 1967, “Old Swimmin Hole” Painting of Conner’s to be place in new Northeastern School. Palladium-Item and Sun Telegram, January 13, 1958, Charles Conner, Artist For Early Implement Firm, Was Self-Taught. Palladium-Item, March 1964; Conner Musicians and Artists Recalled. p.16. Peat, Wilbur. Pioneer Painters of Indiana. Crawfordsville, Indiana: The Lakeside Press, 1954.